As explained in a previous article, water tank requirements in the Adelaide metropolitan area vary in accordance to each council’s rules and regulations. However, there are some specific requirements that all South Australians must observe if connecting your rainwater tank to mains water. “Seamless automatic switching” refers to a device that will automatically switch from your rainwater supply to mains supply when your rainwater tank is low or empty (also known as a rainwater to mains water switch). This device helps you make the most effective use of your tank water and fulfills legislation requiring a continuity of water to toilets and the like. A backflow prevention device (also known as a dual check valve) must also be installed so that water from your tank cannot enter (and contaminate) the mains water supply. Because of the risk of contamination to the mains water supply, backflow prevention devices must be inspected by a licensed plumber annually. For more information, read our article ‘Switching between Rainwater and Mains Water ’. An overflow device must be fitted in order to dispose of any overflow from the rainwater tank. The overflow and inlet areas must be fitted with non-degradable, mosquito-proof screens in order to maintain water quality and safety. Thorough consideration must be given to the structure which supports the rainwater tank. If the rainwater tank isn’t supported appropriately and collapses while connected to mains water, it could rupture or dislodge supply pipework. 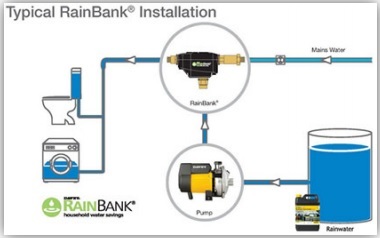 If you are looking for an automatic rainwater-to-mains switch, Team Poly recommends the RainBank mains water backup system which can be mounted to the top of your tank, or on a nearby wall. If you would like further advice, contact us today.